I have been working in Wichita lately and one day I decided to go for a drive around McConnell Air Force Base, near where my client is located. As I came around on the west side of the airfield, I went through the Boeing section of the area. I was looking around at everything that was there and suddenly I see this strange looking massive aircraft parked on the revetment. I just had to stop and look at this closer. 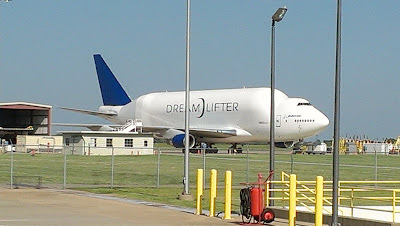 This is the Boeing 7E7 Dreamlifter. As you look at this photo keep in mind that this is a modified 747 designed to carry parts for the 787 Dreamliner. This thing is HUGE! Only 4 are built and they are no longer in service. This think can airlift a maximum of 405,000 pounds of cargo, loaded on the worlds longest cargo ramp though the swing tail cargo door, and has a range of 4800 miles while cruising at a max speed of 545 mph. It may be the craziest aircraft I have ever seen, but it is also the coolest aircraft I have ever seen. I did get to see this thing flying on my last trip down there, but the picture I took was just not that great so you will have to settle for the pictures on the Wikipedia page I linked above. Reminds me of the time we saw the first C4 at Pope AFB it was HUGE for it's time too.